Handmade 100% chemical free bodycare. Totally biodegradable which keeps you and the planet clean. Exciting aromas and natural perfumes in partnership with the unconditional power of mother earth. With 65% of our bodies and 75% of the earth comprised of water that moves and transforms between people, rain, rivers, oceans, and clouds, preserving the purity of our planet’s water is inseparable from preserving ourselves. Highly vulnerable to pollution, the earth’s water is becoming increasingly contaminated by the additives and pollutants contained in ordinary, everyday products. As the chemicals in our products go down the drain, they become irreversibly integrated into a finite supply of water that will continue to circulate from the sea to air to land as long as the earth exists. 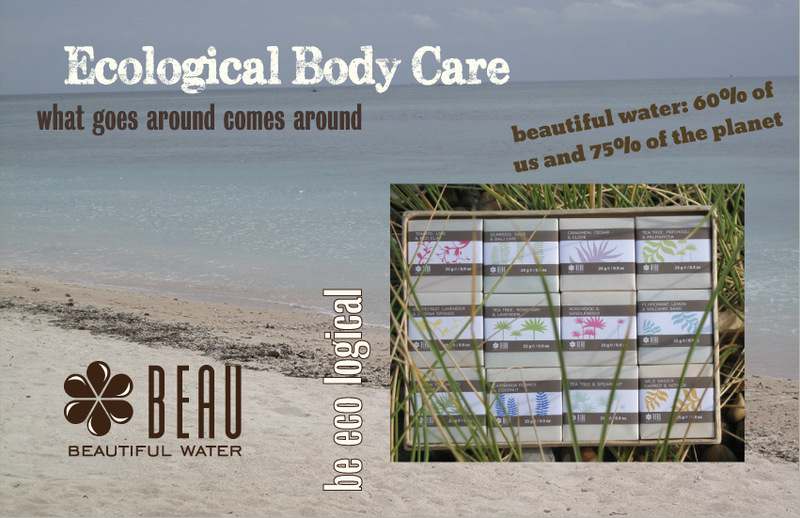 Beau strives to reverse this effect by providing bodycare made exclusively from high quality, environmentally friendly ingredients that keep our water clean. Ecological bodycare contains none of the harsh surfactants, preservatives and other nasty ingredients that can be found in traditional mass- produced products. We took the lauryl/laureth sulphates, parabens, artificial colours, fake fragrances and other harsh chemicals that aren’t good for people or the planet out of Beau and replaced them with the most luxuriously natural ingredients and active botanicals that money can buy and then we found a way to make these products in small factories and cooperatives where people who care about these things were in charge of producing them. Our products are as ecological as they can be. All our lives and the livelihoods of many people depend on it.